Sakata (酒田市, Sakata-shi) is a city located in Yamagata Prefecture, in the Tohoku region of northern Japan. As of October 2015, the city has an estimated population of 105,022 and a population density of 174 persons per km². The total area was 602.97 square kilometres (232.81 sq mi). Sakata has a humid subtropical climate (Köppen climate classification Cfa) with very warm summers and cool winters. Precipitation is plentiful throughout the year, although the months from February to June have somewhat less rainfall. The area of present-day Sakata was the location of the provincial capital of ancient Dewa Province, although the precise location has yet to be discovered by archeologists. A port at the mouth of the Mogami River is known to have existed since the Kamakura period. Although silting rendered it less important in the Muromachi period, the area developed as a major center for the kitamaebune coastal trade during the Edo period. By the early Meiji period, the Honma clan, a local merchant clan, dominated trade and emerged as the largest landholder in Japan. With the establishment of the municipalities system after the start of the Meiji period, the area was organized as Sakata Town under Akumi District, Yamagata Prefecture in 1878. Approximately 80% of the town was destroyed by the 1894 Shōkai earthquake and subsequent fires. The modern city of Sakata was founded on April 1, 1933. The city largely escaped damage during World War II, save for a lone air raid on its port district on August 10, 1945, which left 30 people dead or missing. On October 29, 1976 Sakata suffered from a major fire which gutted 22.5 hectares of its city center, destroying 1,774 buildings and injuring 964 people (and one fatality). On November 1, 2005, the towns of Hirata, Matsuyama and Yawata (all from Akumi District) were merged into Sakata. The economy of Sakata is based on light manufacturing, agriculture and commercial fishing. Major employers include Maeta Seikan, which makes concrete products and has played a major role in supporting reconstruction after the 2011 Tōhoku earthquake and tsunami, Kao, a chemical and cosmetics company and the electronics company, Seiko Epson. Seiko Epson uses the local Shonai Airport for weekly employee charter flights to and from Matsumoto, Nagano since 1997. Honma Art Museum - The Honma Museum of Art is a converted old villa which once belonged to the Honma clan. The villa was used by the lords of the Sakai family in the Edo period, After Edo, it was used as a guesthouse of Sakata City. Some of the fine arts items in the museum's collection were donated by other clans in Japan, other furniture and fixings belonged to the Honma family. The museum has a garden from which Mount Chokai can be seen. Sakata City Museum of Art - Contains a permanent collection which mainly focuses on the work of sculptor, Takahashi Go and painter, Saito Chozo. The museum is located 20 minutes from Sakata Station and has views of nearby Mount Chōkai. 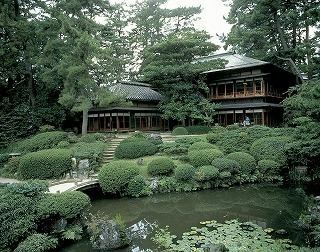 Dewa-yushinkan - A Tea House complex located beside Sakata City Museum of Art. It was built in 1994 and has a traditional Japanese design. Soumaro - A traditional Japanese restaurant dating back to the Edo period, where guests can enjoy performances from Maiko dancers. The culture of Maiko dancing in Sakata is a result of the city's close trading relationship with Osaka and Kyoto in the past. The building has been carefully renovated and contains many traditional features. Maiko dancing performances take place daily at 14:00. 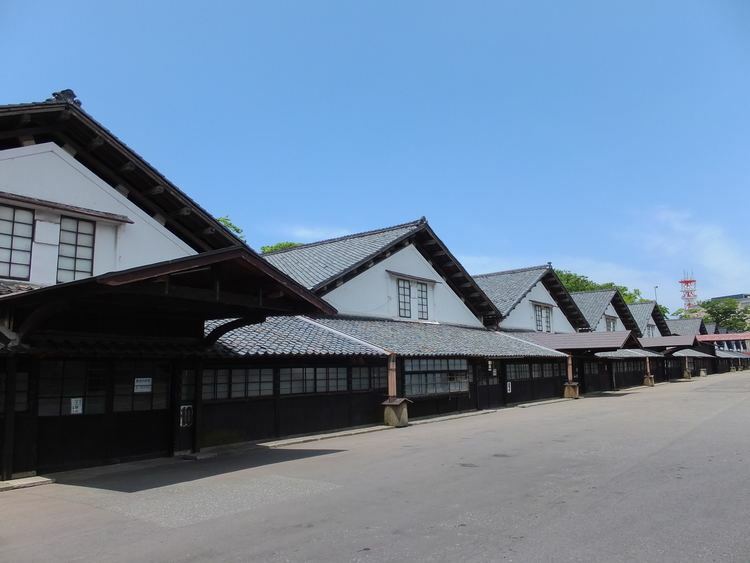 Sankyo Storehouse - This storehouse was built in 1893 to store Shonai rice. On the storehouse's southern side, there is a line of 41 Zelkova trees, which were planted over 150 years ago to help keep the temperature of the storehouses low during the hot summer months. The modern day storehouse contains a small museum with information regarding the history and culture of Sakata, a restaurant and a souvenir shop which sells local foods and sake. Hiyoriyama Park - A park located close to the city center which offers panoramic views of the Port of Sakata. There are over 400 cherry trees in the park and it is home to a cherry blossom festival in late April. Kaikou-ji Temple - Shingon Buddhism temple located in the centre of Sakata near Hioriyama Park. The temple contains the remains of two priests who starved themselves to death through a process of self-mummification called sokushinbutsu. 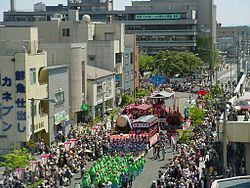 - Sakata Festival is a historical festival held every year in the center of the city between May 19 and May 21. The first festival was held in 1609 during the Edo period. In the past, it was called Sannou Festival. However, after a large fire damaged much of Sakata in 1976, the festival became a memorial event and was renamed Sakata Festival. There is a large parade in the central streets of the city, which features festival floats and dancers from schools, local companies and community organisations. 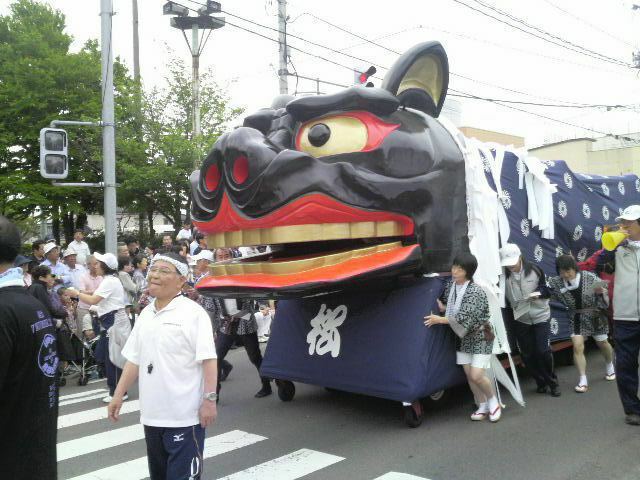 Huge 'shishi gashira' (lion heads) are symbols of the festival. It is said that children chewed by the shishi gashira will become smart and healthy. About 350 stalls line the side of the main street selling snacks, drinks and crafts. Okuribito (English title Departures), 2008, winner of the Oscar for best foreign film. Set in present time, a newly unemployed cellist takes a job preparing the dead for funerals. Oshin, 2013, a film about the life of a young girl named Oshin who grew up in poverty in the Sakata region. The film was directed by Shin Togashi.